The integration of multiferroic materials in the new generation of nanostructured electronic devices requires precise and orderly control of the thin films growth, taking into account the nature of such materials to develop domain structures, that is, regions of the material in which all the polarization and/or magnetization are aligned in the same direction. One of the methods to achieve this is known as strain-engineering that uses monocrystalline substrates and different growth techniques such as; chemical vapor deposition (CVD), chemical solution deposition (CSD) via sol-gel procedure, pulsed laser deposition (PLD), rf-magnetron sputtering and sophisticated and costly deposit techniques such as molecular beam epitaxy (MBE). Fig. 1. Low-resolution (A) and high-resolution (B) TEM cross section images of the interface of the KNNLa films on STO substrate with orientation ; in (C), the Fourier transform of the interface region in (B). Among the techniques mentioned, rf-magnetron sputtering is a particularly attractive technique for applications because it allows extensive deposition area and is formally established in the industry, especially in the actual microelectronic manufactures. On the other hand, a significant factor to enhance the crystalline growth is that the substrates and samples should heat-treated under the appropriate temperature annealing, before and after the deposition processes. With our work, we have demonstrated that stablishing the optimal conditions of each deposition process, the rf-sputtering is an excellent technique to obtain epitaxial growths. Thus, with an adequate selection of the substrate, the growth and the arrangement of ferroelectric domains can be designed and fabricated following a technological application as memory devices, sensor, actuator, among others. As a particular case, we have achieved high crystalline quality, highly oriented and epitaxial thin films of the lead-free ferroelectric La-doped (K0.5Na0.5)NbO3 (KNNLa) compound (Fig. 1), on single crystals of SrTiO3 (STO) substrates with orientations  and , using the rf-magnetron sputtering technique combined with appropriate thermal treatments. To enhance the crystalline growth, the STO substrates and the KNNLa/STO samples were heat treated under an O2 atmosphere at the annealing temperature of 585 °C, before and after the deposition processes. Conditioned by the surface parameters, crystal structure, and chemical composition of the STO substrates, the KNNLa films grown with highly ordered ferroelectric domain arrangements, forming a maze-like mesh where the short-rods are oriented at ~ 45° with respect to the  and  directions of the -substrate (Fig. 2A) or forming a stacking of large-rods in-plane on the -substrate surface (Fig. 2A), mutually parallel along the  direction and perpendicular to the [1ī0] directions of the STO. Such constrained growths show well defined bright and dark contrast (Fig. 2C y 2D) corresponding to up and down ferroelectric domains, respectively; i.e., domains with opposite polarization switched along the out-of-plane orientation, characteristic of domain walls of 180°. As consequence of different constrain conditions, the as-grown KNNLa films on -substrates show pointing down polarization and higher coercivity values; while, the as-grown KNNLa films on -substrates the domains grow with the polarization pointing up with lower coercivity. Fig. 2. 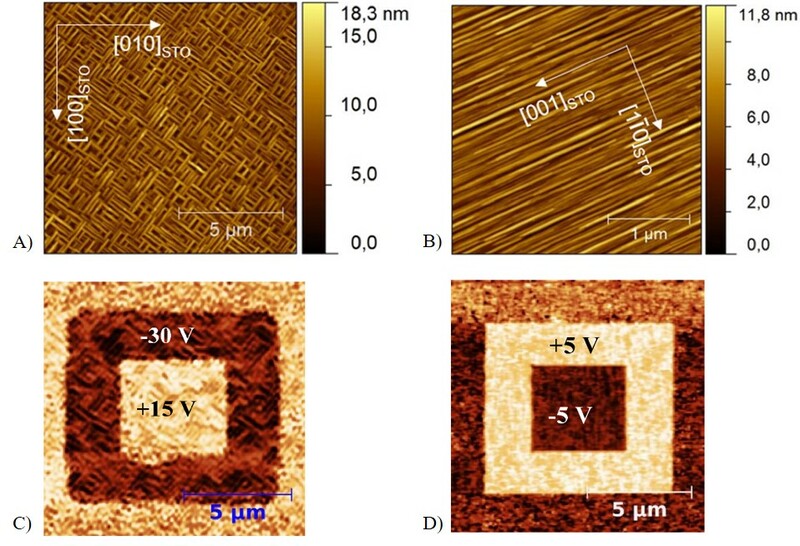 Atomic Force Microscopy topography and Out-of-plane Piezo Force Microscopy images for KNNLa films grown on STO substrates: (A and C, respectively) with orientation , and (B and D) with orientation . In summary, our results show a high ordering of the ferroelectric domains, constrained by the structural parameters of the substrate surface, auguring a great potential for the use of the sputtering technique in domain strain-engineering. 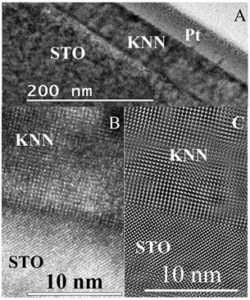 Structure and piezo-ferroelectricity relationship study of (K0.5Na0.5)0.985La0.005NbO3 epitaxial films deposited on SrTiO3 by sputtering.